The MiG-21 was the Soviet Union's first truly modern, second-generation jet fighter. Testing began in 1956, and the first version entered service in 1960 as the MiG-21F-13. 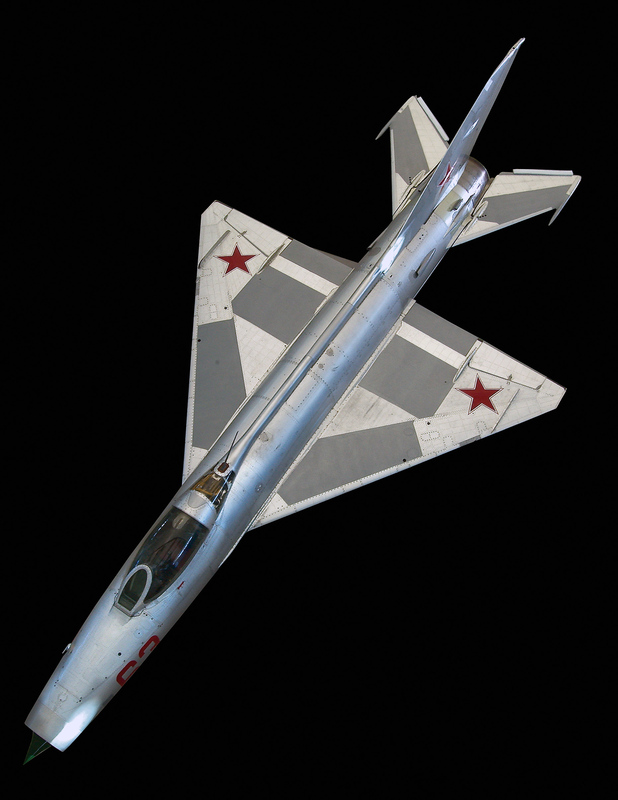 Soviet designers developed a unique "tailed delta" configuration with a very thin delta wing, which gave the aircraft maneuverability, high speed, good medium-altitude performance, and adequate takeoff and landing characteristics. The MiG-21 became the standard Soviet clear-air interceptor. With the addition of radar, more powerful engines, and other modifications, it became a multi-role fighter. More than 6,000 MiG-21s of 12 types were flown by over three dozen nations. 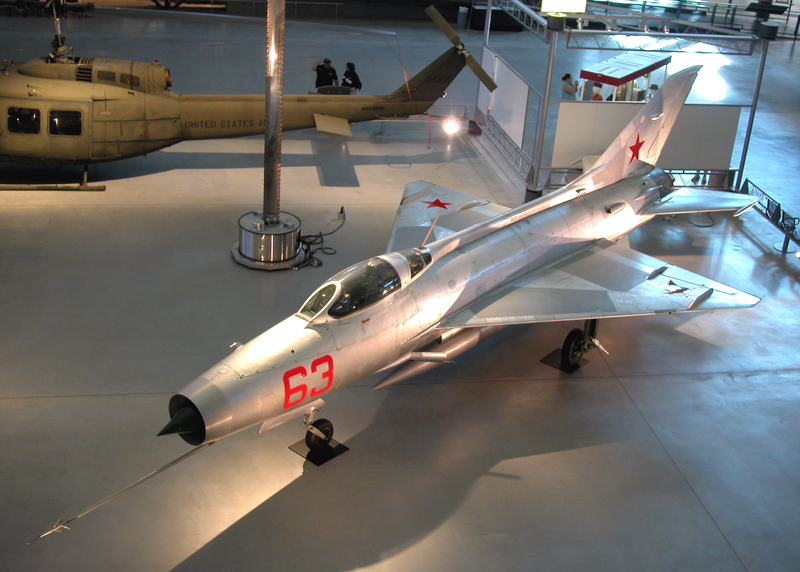 This MiG-21F-13 was displayed in a Soviet military hardware exhibit at Bolling Air Force Base, Maryland, as part of a "Soviet Awareness" training program. Its service history remains unknown. The MiG-21 was Russia's first truly modern second-generation jet fighter. The Russian Central Aerohydrodynamic Institute (TsAGI) developed a unique "tailed delta" configuration with a very thin delta wing. This wing gave the MiG-21 maneuverability, high speed, good medium-altitude performance and adequate takeoff and landing characteristics. Testing began in 1956, and the first version entered service in 1960 as the MiG-21F-13. It was equipped with the K-13 infrared homing air-to-air missile, known in the West as the AA-2 ATOLL and purportedly a copy of the U.S. "Sidewinder" missile obtained from China following air-to-air clashes with Taiwan over the China Sea. The MiG-21 soon became the standard clear-air interceptor for the Soviet Air Forces. By adding radar in the MiG-21PF and more powerful engines and blow-up flaps in the MiG-21S, the aircraft became a multi-role fighter. It could operate in all weather and carry a wide variety of air-to-ground munitions in an attack role. Reconnaissance and trainer versions also flew. The fighter benefited from a series of reliable, high-powered engines (the R11F through the R25) developed in parallel with the airframe by the S.K. Tumanskiy engine design bureau. More than 6,000 MiG-21s of 12 types were flown during the next 30 years with the USSR's Frontal Aviation and IA-PVO (anti-aircraft forces). The USSR used the MiG-21 as part of its effort to establish international relationships and exported many hundreds of these aircraft. India is a major user, and has itself produced large numbers of the MiG-21FL, MiG-21M and MiG-21bis. China also built the aircraft as the F-7. The MiG-21 saw combat around the globe almost from the moment when it was first exported. It has served with Arab states against Israel in the Six-Day War during June 1967 and in the October 1973 Yom Kippur War. Israel claimed 245 air-to-air kills against MiG-21s in a 16-year period beginning July 1966, but Israeli losses to MiG-21s are unknown. In India, it flew against Pakistan in December 1971 (this combat included the first-ever encounter between the MiG-21 and the Lockheed F-104A). It was also met over North Vietnam by American forces, which established a kill advantage of 5.5:1. Although these earlier MiG-21s had advantages in cost, durability, and mid-to-high altitude performance, they also had disadvantages which contributed to the losses: short range, less advanced avionics, a poor view (both to the front and the rear), and inadequate armament. The range problem was alleviated but not eliminated by adding saddle-type auxiliary fuel tanks. Avionics--including radars--were improved throughout the aircraft's career, better armament was added and the structure was strengthened. Later versions of the MiG-21, such as Yugoslavia's MiG-21bis FISHBED N, are still met in combat even today. The MiG-21F-13 FISHBED C exhibited by the National Air and Space Museum carries the possible construction number "Series N 19, GREG N 19A, 19 4 62" and the number "2106." The numbers "19 4 62" may refer to the date 19 Apr 1962. Meaning of the acronym "GREG" is unknown. The U. S. Air Force donated this MiG-21F-13 to NASM in August 1990. For many years it was part of the exhibit of Soviet military hardware housed at Bolling AFB, Maryland, in the "Soviet Awareness" training program. The MiG's prior history is unknown. Belyakov, R. A., and Marmain, J. "MiG: Fifty Years of Secret Aircraft Design." Shrewsbury, England: Airlife, 1994. Gunston, Bill. "Mikoyan MiG-21." London: Osprey, 1986. Gunston, Bill, and Gordon, Gunston. "MiG Aircraft Since 1937." London: Putnam, 1998. Charles E. Otis and Peter A. Vosbury, Encyclopedia of Jet Aircraft and Engines (Jeppesen Sanderson Training Products, 1997), 143. Bill Gunston, World Encyclopaedia of Aero Engines 4th Ed. (Sparkford, Nr Yeovil, Somerset, England: Patrick Stephens Ltd., 1998), 185. Single-seat, single-engine, jet fighter. Soviet Union.